Adrienne Janic (AJ from Chip Foose's Overhaulin) gets a 1968 Pontiac Firebird built by Year One. This bad machine features an LS3 and all the goodies that make it a real street driven hot rod. Many of us get into our cars after work and try to wipe our minds clear of the business day. It forms a division between your work and home life, usually a necessity for maintaining sanity. This wasn't the case for Adrienne Janic (or A.J. for short), former co-host of the popular TLC program Overhaulin'. A.J. spent countless hours overseeing the modification and restoration process performed on the show, and realized she had to have a hot rod of her own. When she first started on Overhaulin', A.J. didn't know a thing about cars, and she was perfectly honest with the production and build team about it. She didn't want to fake the car girl thing because she knew no one would buy it. Just like a 12-step program, the first step is to admit you have a problem. "I knew absolutely nothing about cars, but the show turned out to be the best school I ever had. The build team spent a lot of time showing me the ropes and getting me more and more involved," she shares. In season five of Overhaulin', A.J. was given a special assignment. "It was like the final exam, to see if I had been paying attention," she says. She was to be responsible for the design of a young lady's '63 Comet. At this point, A.J. had a lot of time to absorb the information presented to her on the show, and came up with an amazing design. Getting to see the final product and to receive praise for her vision gave her the confidence to build her own car. There was no doubt in A.J. 's mind what car she wanted. 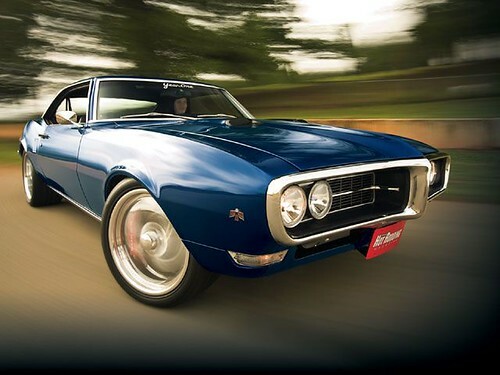 The Overhaulin' episode titled "Uncle Sam's Nephew" featured the build of a 1968 Firebird. "This was the most stunning car ever. When introducing David, the owner of the car, I whispered, 'You know, if you don't like it or want it, ill take it.' He faked a little smile at the joke. I leaned in again and told him I was serious; he clenched his keys a little tighter. 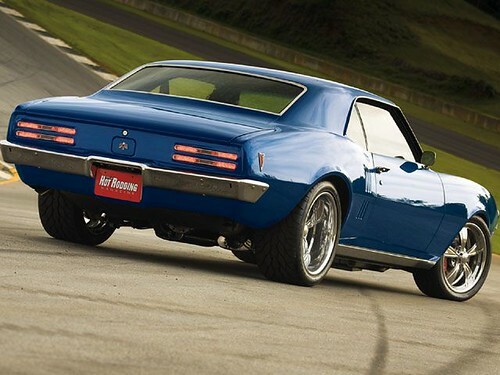 That's when I knew a 1968 Firebird was the car for me," says A.J. She felt it was the perfect blend of masculine and feminine cues. It has the potential for brutal power and handling, yet has smooth styling, and all in a compact, lightweight package. The next step was to find the perfect place to have her dream realized. Hollywood hot rodder hubby and Overhaulin' producer, Bud Brutsman, knew exactly where to go. He had his 1969 Mustang fastback built by Year One a couple years ago, and the build turned out phenomenal. A.J. took a trip to Georgia, home of Year One, with a clear vision of what she wanted. The guys there suggested she might do a Mustang or a Camaro, but she knew the Firebird was meant for her. She began to describe how she wanted the car to be built. She wanted a strong foundation, modern upgrades, and it needed to be reliable. A large percent of build time is usually dedicated to brainstorming and trying new tricky things, but the simplicity of her desires allowed a smooth buildup in a very short amount of time. From start to finish, it took Year One about six months to create. A.J. traveled to Georgia as often as her busy schedule would allow. She prides herself on not being the girl who sits around and has the boys do all the work. Despite her good looks, she isn't afraid to get some dirt under her nails. She recalls an episode of Overhaulin' where she was elected to crawl inside a '57 Corvette to tear out the interior because she had the smallest body of the bunch. The car was filled with rat droppings and spider webs, but it didn't faze her. She ended up suffering from a severe spider bite that earned her a trip to the hospital. Compared to this, working on the clean-bodied 'Bird was a walk in the park.